just got my x5470 up and running on my ga-ep45-ud3r and did some overclock testing. 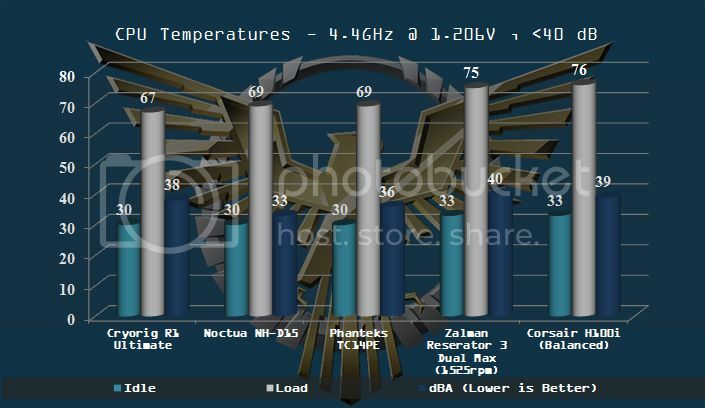 im at 70c at 4.0 with 1.26 vcore using cooler master v6 with stock fans. i'd like to get to 4.4 which from doing some research will require around 1.32 vcore. will a single width 120mm unit get the job done, say a antec kuhler 650 or will i need double width 120 or 240 unit? i have 3 noctoa s12a's in the case one on the front drawing in one on the side drawing in and one on the rear right behind the v6 drawing out. Top air coolers are as good or better than CLCs. Swiftech H220 is a little better than top air. Just a warning, LGA 771-775 brackets might be harder to find now. Companies do not bundle systemically in their package, so you might want to take a look at this first. I saw a couple reviews that they only specified LGA 1155-1156, LGA 2011 on the Intel side. 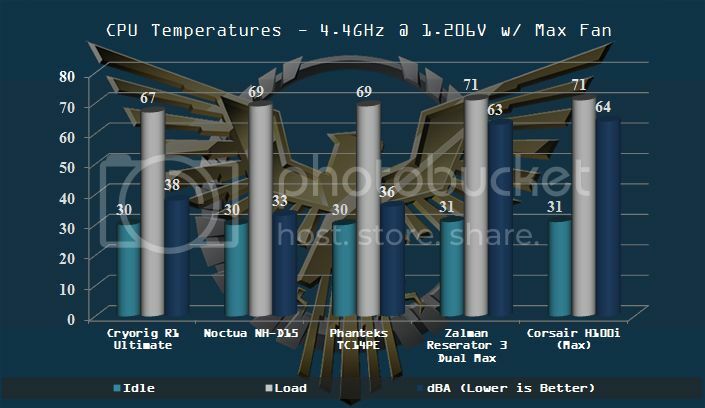 Usually, I would say that the gain from any cooler you would get from a CM v6 with two fans would be minimal (3-4 degrees max) with whether the NH-U14s or Thermalright Archon, or a dual tower cooler. The higher tier of closed loop coolers (240mm rads +) would have a sizeable advantage over it, but prepare to pay more than a hundred. I know this is a good processor, but with age you might not keep it at 4.4 stable for a long period. Testing done on open bench or is well ventilated case show air coolers as good or better than CLC. And when the CLC fan speed is lowered to same noise level as air cooler the performance difference is even greater. Honestly, air cools as well or better than CLC, all things being equal. Problem is most testing handicaps air cooler! CLC like H100i add 2 additional case radiator / case fans and use case to separate the radiator's heated exhaust from cool intake air. Optimize case airflow so air cooler gets same temperature air and it will be just as cool.. and quieter as well. We can't hear 2dBA difference, 3-4dBA yes. Every 10dBA increase sounds twice as loud to us... 20dBA sounds 4 times as loud, 25dBA increase sounds 6 times as loud, 30dBA increase sounds 8 times as loud.